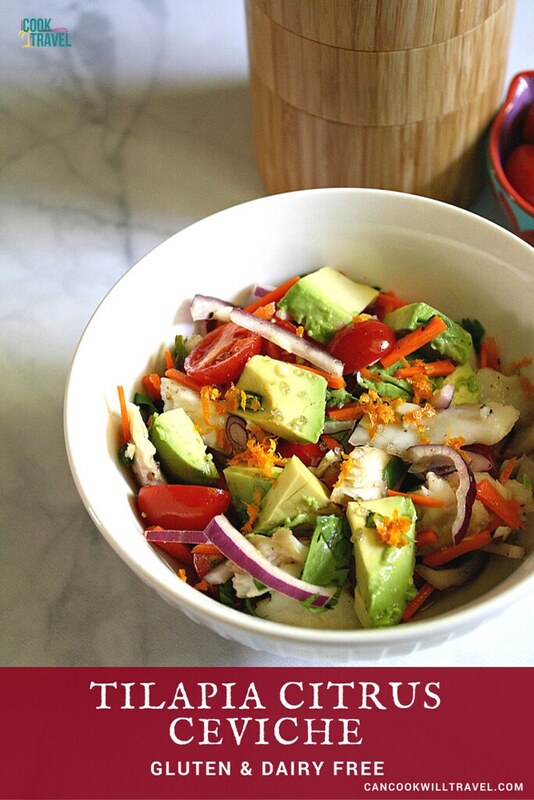 This week I was craving a healthy meal and suddenly ceviche popped into my head. I hadn’t had it in ages, but it’s always something that makes me think of my mom, and how fitting since it’s Mother’s Day month. She loves ceviche, and once it was on my head I knew I had to make it. 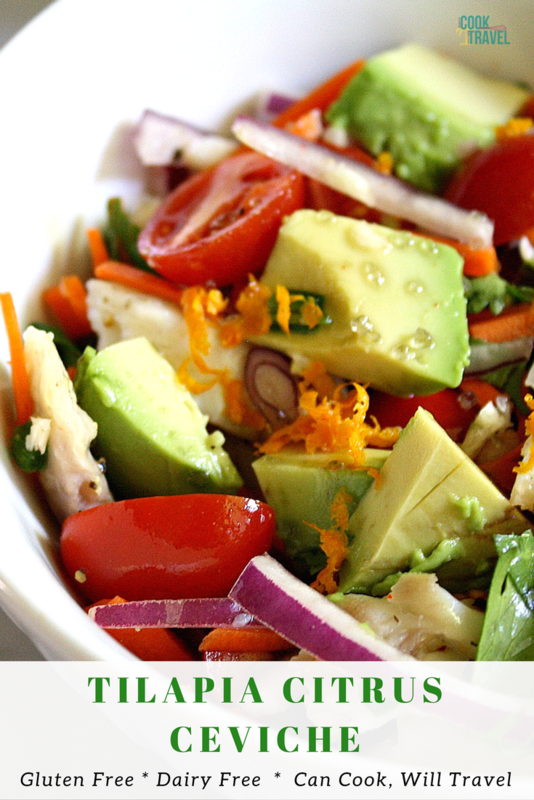 And this Tilapia Citrus Ceviche is the perfect answer to these cravings. If you haven’t had ceviche before, then I’ve always had it in a kind of salad form. With either shrimp and/or fish and scallops that “cook” in citrus and are accompanied by veggies. Now here I am in Kansas City, so I’m usually buying my fish frozen, because it’s typically fresher that way. And what I loved about this recipe from Tone It Up that inspired this week’s culinary adventure, is that the tilapia is baked briefly. 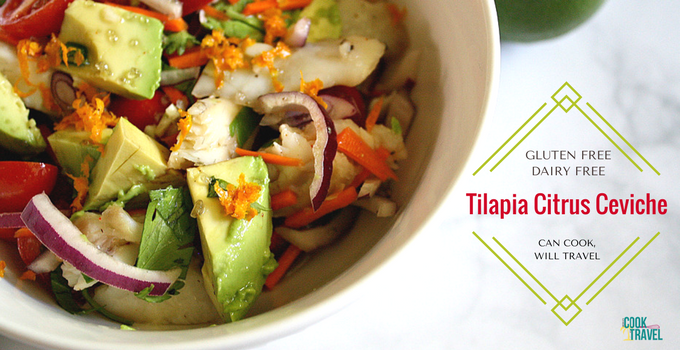 This Tilapia Citrus Ceviche is also really easy to make. It’s a 3 step process, and you can make it in advance. First create a bed of foil to put the tilapia on and then add the juice of a lime to it. Seal up the fish in a foil packet and broil it for 5-6 minutes. The recipe says to flip it, but I realized that was going to be messy, so I broiled it for 5 minutes without flipping. Then carefully open the foil pouch and use a fork to break up the fish into bite-sized pieces. And we’re onto step 2, where the fish is then put in a bowl, and I poured the lime juice over it. Then add the juice of a lemon to the boil, cover, and refrigerate for about 2 hours. While the fish chills, slice the red onions, carrots, and jalapeño. Right before you’re ready to put it all together, mince the garlic, slice the tomatoes, and chop the cilantro. Finally drain off the citrus juice from the bowl and stir all of the veggies together along with the garlic, some pepper, and cayenne. I like my ceviche cold, so I popped it back in the fridge for another 15 minutes. Then I served the ceviche with a little avocado, orange zest, and finishing salt. Seriously this Tilapia Citrus Ceviche tastes delicious, and it’s bright and packed with flavors. Not only did it exceed my expectations, but it was a totally healthy and fresh lunch. I love when that happens! Also, I do like some heat to my food, but the jalapeño wasn’t super hot. So I’d recommend adding it as it’s a nice subtle spice. And the creaminess of the avocado was a great balance to the citrus and spice and onion. I’m pretty confident this ceviche would make my mom proud, because it’s light, refreshing, and crazy good! So the next time you’re wanting to eat healthy and would like a light meal, you should absolutely make this Tilapia Citrus Ceviche! Click that link for the recipe and step by step instructions, so you can be eating healthy and guilt free too! Happy ceviche making! Two years ago: Spicy Honey Mustard Brussels Sprouts May Lead to a Happy Dance! Six years ago: Cooking with Rhubarb!